The notes on paintings in sixteenth century Venetian homes made by Venetian patrician and art collector Marcantonio Michiel are perhaps the most important primary source for the works of Giorgione. However, Michiel’s notes indicate how even the testimony of a contemporary eyewitness must be used carefully. 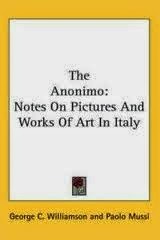 Abate Morelli published the notes in 1800 under the title, “The Anonimo, Notes on Pictures and Works of Art in Italy.” Morelli used “Anonimo” because he could not be sure of the author. Today, scholars believe that the notes were the work of Michiel. The cities visited by Marcantonio Michiel were Padua, Cremona, Milan, Pavia, Bergamo, Crema, and Venice. In Venice the notes recorded visits to fourteen homes of Venetian patricians as well as visits to the church and school of the “Carita” which is now the site of the famed Accademia. The publication of the Notes provided a look into the artistic preferences of some of the greatest families in Renaissance Venice but also shed much light on the artists, especially Giorgione. For example, the notes provided the first mention of the “little landscape on canvas,” now called the “Tempest”, that in 1800 remained largely out of sight in a private home. Altogether Michiel mentioned 18 works in the homes of seven collectors that were either by Giorgione, possibly by Giorgione, or copies by others based on Giorgione. In an earlier post I provided a list in chronological order. I used the 1903 English translation edited by George C. Williamson and included some of the editors notes. While Michiel’s observations are invaluable for purposes of attribution, his brief notes rarely attempt interpretation or analysis. For the most part, he seems to be content to point out identifying markers. Even there he can be mistaken about the subjects of the paintings he saw with his own eyes. She also argued that his eyes deceived him when it came to Giorgione’s most famous painting seen in the home of Gabriele Vendramin in 1530. Despite her caveats, even Anderson was led astray by Michiel’s description of a Giorgione in the home of Taddeo Contarini. Here is his note. In the House of Messer Taddeo Contarini. 1525. The picture on canvas, representing the birth of Paris, in a landscape, with two shepherds standing, was painted by Giorgio di Castelfranco, and is one of his early works. This painting has been lost but seventeenth century copies still exist. It gives us a very good illustration of Michiel’s limitations as an observer. 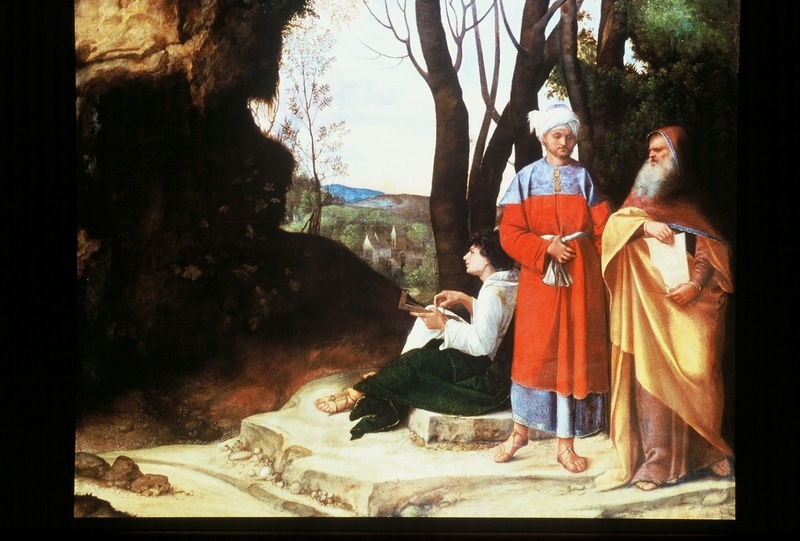 He knows that the painting is an early Giorgione but his description does not even mention the two prominent figures on the left: an elderly man with a flute or pipe, and the young woman with arm and leg shockingly exposed. In my paper on the Tempest I have shown that Michiel’s brief identification of this lost painting was indeed incorrect. 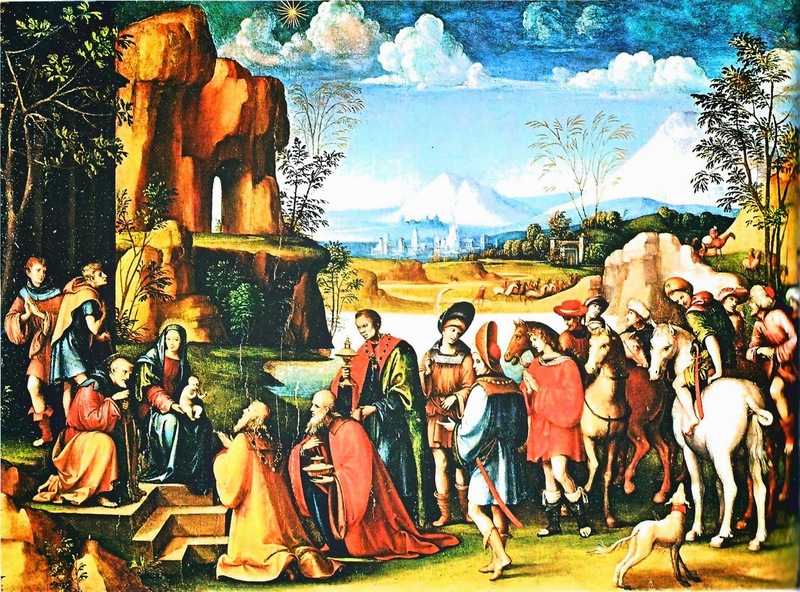 The subject of the painting is a “sacred” one: “The Encounter of the Holy Family with Robbers on the Flight into Egypt.” A popular legend of the time explains every detail in the painting including the lounging figures in the middle distance. Nevertheless, his identification has stuck and led scholars to draw some fanciful conclusions. Anderson, for one, was surprised that Michiel had not seen in Contarini’s home the “notte” mentioned in correspondence between Isabella d’Este and her Venetian agent after Giorgione’s death in 1510. Anderson could only conclude that the “notte” or night scene must have been in the home of another member of the Contarini family. 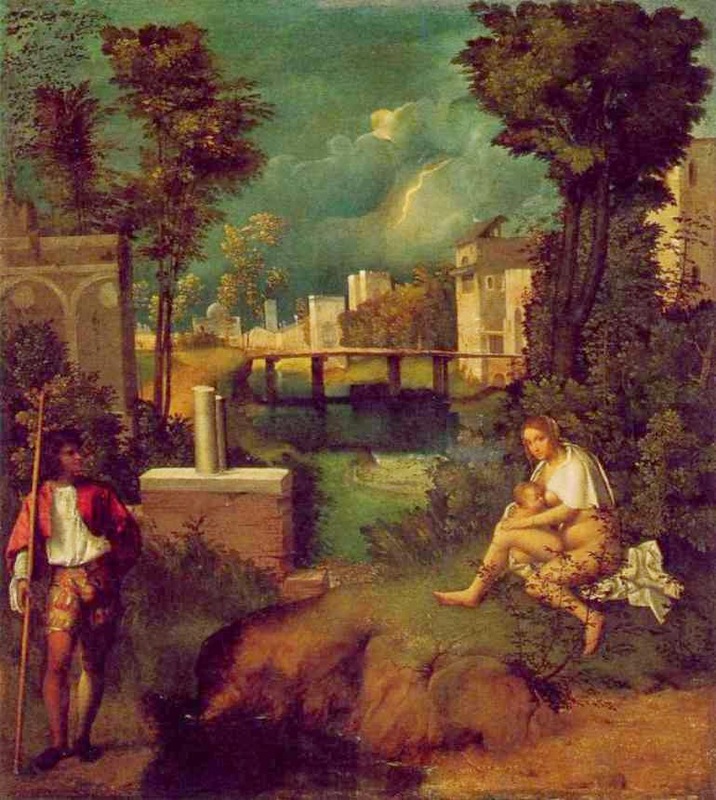 Yet, it is very likely that this lost Giorgione was the “notte.” After all, the sun is setting in the distance. *The Anonimo: Notes on Pictures and Works of Art in Italy Made by an Anonymous Writer in the Sixteenth Century, translated by Paolo Mussi, edited by George C. Williamson, London, 1903. Facsimile copy by Kessinger Publishing. ** Anderson, Jaynie: Giorgione, 1997, p. 57. This description settled the question of attribution and gave the painting its current label, but it did not settle the question of subject or interpretation. Most scholars have accepted Michiel’s identification of the three men in the painting, and have spent much time and effort trying to identify which philosophers they might be. Others believe that Michiel’s identification was mistaken and that the three men are the biblical "three Kings" or “Magi” as they first behold the Star of Bethlehem. In earlier posts I added my two cents to the controversy and argued that the colors of the garments of the three men are symbolic of the gifts of gold, frankincense, and myrrh offered by the Magi. I know that while gold is almost invariably the color of the eldest of the Magi, there is a no one color scheme for the other two. However, I would like to post here another depiction of the Magi attired in gold, red, and green. This one is by Francesco Raibolini (c. 1450-1517 Bologna) known simply as Francia to his contemporaries. It is a small "Adoration of the Magi" from about 1499 that I believe is in the Dresden Gemaldegalerie. Largely forgotten today, Francia was one of the most famous and respected painters of the late Quattrocentro. Please excuse the poor quality of the image but it is clear that the eldest Magi is clothed in gold, the middle-aged one in red, and the youngest in green. Perhaps Giorgione was not as innovative in this respect as I originally thought. As I mention in my essay, these colors could have been worn by the Magi in the frequent plays and processions that Venetians never seemed to tire of attending. 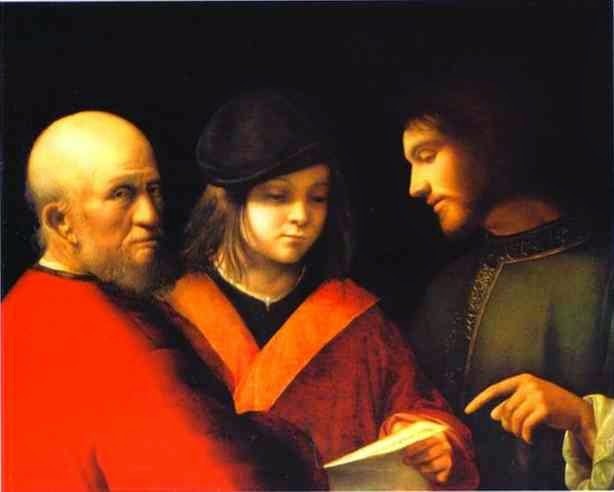 I also believe that “The Three Philosophers” was not the only instance in which Giorgione used colors symbolically to identify his religious figures rather than resorting to stock symbols. In the so-called “Three Ages of Man” that now hangs in the Pitti Palace, the colors of the garments of the three men are more than enough to identify them as Jesus, St. Peter, and the rich young man. St. Peter, in particular, is identified by his bright red robe, red being the color of martyrdom. 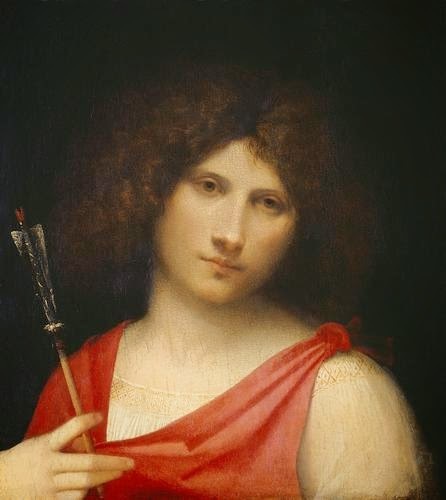 Giorgione also used red for the tunic of the young man in the so-called “Boy with an Arrow.” That color should help to identify this mysterious figure holding an arrow as the martyr, St. Sebastian. Giorgione: "Boy with an Arrow". For convenience I append my original essay on the "Three Philosophers" below. *The Anonimo, Notes on Pictures and Works of Art in Italy made by an Anonymous Writer in the Sixteenth Century: ed. By George C. Williamson, London, 1903, p. 102. The "Three Philosophers" is one of only a handful of paintings that scholars definitively attribute to the great Venetian Renaissance master, Giorgione. 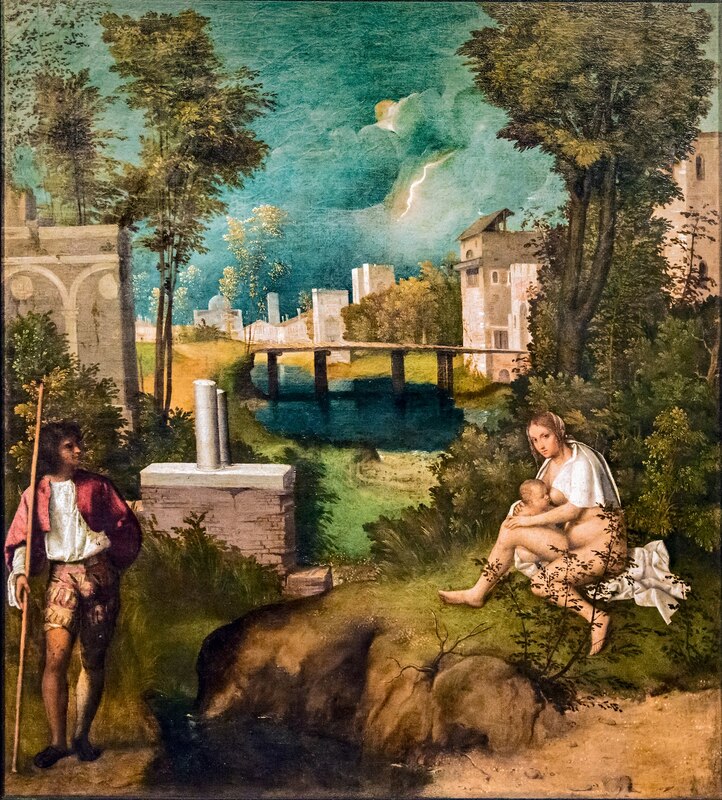 It was one of the highlights of the magnificent exhibition, "Bellini, Giorgione, Titian: The Renaissance in Venetian Art," which recently ended at the National Gallery in Washington. At the symposium which ended the exhibition, one scholar entitled his talk, "The Moment of Giorgione." Another scholar who was given the task of summing up said that despite the greatness of the works by Titian and Bellini, the exhibition was all about "Giorgione." What did they mean? Besides the universally acknowledged quality of the works attributed to Giorgione, there is an air of mystery about the painter. His death in Venice in 1510 at about the age of thirty cut short an incredibly promising career. Although Giorgio Vasari in his famous work on Renaissance painters devoted a whole chapter to Giorgione, there is little biographical data. Scholars think that he apprenticed in the workshop of the prolific Giovanni Bellini, but then went off on his own. 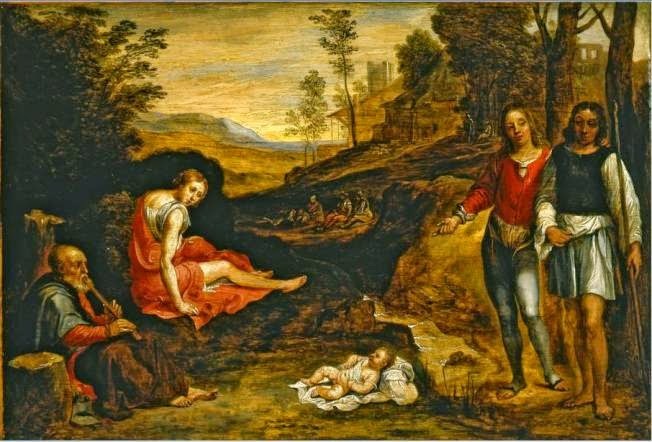 He was either a mentor, colleague, or rival of the younger Titian who apparently completed some of Giorgione's unfinished paintings after his untimely death. In 1525 Marcantonio Michiel, a Venetian patrician and connoisseur, catalogued the paintings in the collection of Taddeo Contarini, another Venetian aristocrat, and described this one as "three philosophers in a Landscape." Two hundred and fifty years later the painting had found its way to the Kunsthistorische Museum in Vienna, its current home. In a 1783 catalog it was called, "Three Magi." Since them scholars have debated whether the men are philosophers, astronomers, surveyors, representatives of the three ages of man, representatives of three religions, or the Wise Men or Magi of the Biblical account. Moreover, at the conclusion of the Symposium which ended the exhibition in the National Gallery another scholar offered a striking piece of evidence in support of the Magi. The exhibition itself had done an excellent job of educating the public on the value of using scientific techniques to evaluate the "underpainting" of some of these Renaissance masterpieces. X-rays and other techniques show many "pentimenti" or changes of mind on the part of the artists. When working with oils, the artists would frequently alter their paintings by painting over the original.